JAPANESE B2 ORIGINAL MOVIE POSTER. LINEN BACKED READY FOR FRAMING. For Thousands of Vintage Movie Posters. We sell more vintage original STAR WARS posters than anyone in the galaxy! To view our entire STAR WARS inventory. Perfect for a high end home theater. Highly sought after by movie poster collectors and aficionados. Get notified of our AUCTIONS & NEW INVENTORY instantly! 20.25" x 28.75". Japanese B2 ORIGINAL MOVIE POSTER issued by the studio when the film was released and meant for theatrical display. This poster has been Linen Backed and is ready for framing. This is a vintage original poster from our archives. These can be very difficult to find in any condition! A long time can go by without one of these coming up for sale. You will have trouble finding a nicer one. Prior to linen backing this poster was rolled, never folded. We evaluate and grade our linen backed posters prior to linen backing / restoration. We do this because after a poster has been restored it can sometimes be very difficult to determine exactly what was done to it. Our restorers are world renowned and can make a poster look Near Mint and flawless even if it originally had several unsightly defects. This poster is considered to be within that class and is definitely INVESTMENT QUALITY. This is NOT a reprint or reproduction poster! It is a REAL ORIGINAL MOVIE POSTER issued by the studio when the film was released and meant for theatrical display. We are absolutely certain it is authentic. You may be willing to take the risk to save a few dollars, but we are not. We use super strong hi-quality packaging materials including thick cardboard, masonite, and costly pvc plastic tubes. And guaranteed to arrive safely. It will answer any questions you may have. Please scroll to the bottom of this listing to see if we have made any changes or added any additional information. Please be advised that over 95% of all Original Movie Posters. Printed before the mid 1980's were issued FOLDED. This is NOT considered a defect. Vintage rolled posters do exist, however they are extremely rare. C8 Excellent - Investment quality. Pin holes, small tears, etc. C7 Very Good to Excellent - Fine. Still a very nicely preserved item. C6 Very Good - The typical used poster in average condition. C5 Good to Very Good - A heavily-worn item. C4 Good - Below average but still suitable for display. WE TAKE EXTRA SPECIAL CARE WHEN WE PACKAGE YOUR ITEMS. Folded posters are placed in a plastic bag or envelope and in between STRONG pieces of cardboard and taped together before being placed in the package. Rolled posters are put into a plastic sleeve and then placed in a HEAVY-DUTY TOUGH 3 or 4 diameter thick walled PVC tube. We roll the poster into a smaller diameter than the tube. This is VERY IMPORTANT because it gives the edges strength and helps to prevent them from getting wrinkled. We add soft cushioning material also very important! Unless otherwise specified in the description, ALL POSTERS ARE ORIGINAL MOVIE POSTERS original theatrical movie posters that were displayed or meant for display (unused) in theaters at the time the movies were released. We will put in writing that we guarantee it to be an Original Movie Poster. 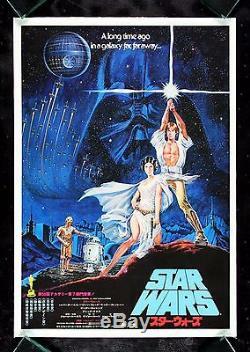 The item "STAR WARS CineMasterpieces 1977 VINTAGE ORIGINAL JAPAN JAPANESE MOVIE POSTER" is in sale since Tuesday, April 19, 2016.